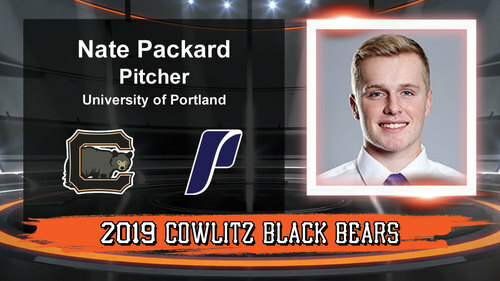 The Cowlitz Black Bears are happy to announce the signing of the University of Portland junior Nate Packard. Packard is right-handed pitcher beginning his first season at UP. Before arriving at Portland, he had two great seasons at Tacoma Community College. He commands a fastball that has movement with plus secondary pitches. He also locates very well and competes in the zone. Packard comes from Puyallup, Washington, where he played and graduated from Emerald Ridge High School. Please welcome Nate Packard to the Cowlitz Black Bears!